In case you missed it, there’s a tremendous public debate roiling in the U.S. about whether bankers and Wall Street financiers profited from the current economic downturn after being bailed out by taxpayers. Certain politicians and talking heads have admonished the Occupy Wall Street protestors for engaging in “class warfare,” but populist rage against “fat cats” is not new. 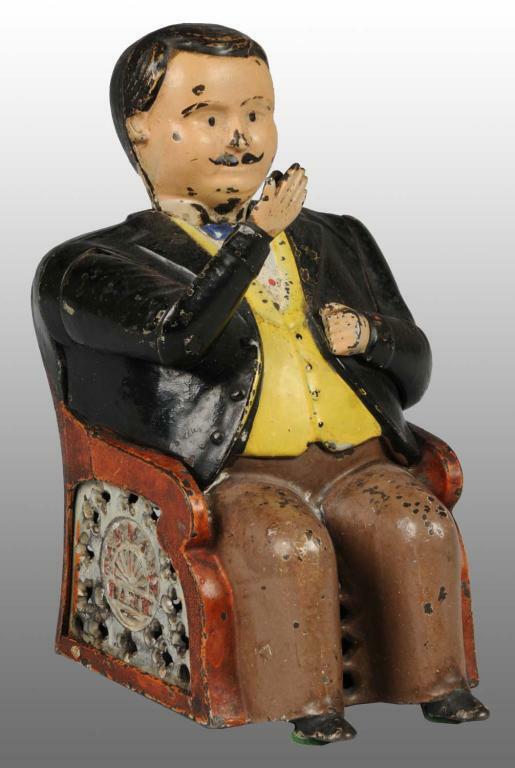 Cast-iron mechanical banks from the late 19th century depict fat bankers and politicians slipping coins into their own pockets, as seen in the 1873 Tammany Bank (below), which was thought to mock Boss Tweed of Tammany Hall, New York City’s political machine. As a counterpoint, Bread Winner’s banks show hard-working laborers taking money away from crooked politicians. After the Great Stock Market Crash of 1929, tycoons and stock brokers were vilified for their role in crash, which led to a decade of economic turmoil and widespread poverty. However, during the Great Depression, the fantasy of striking it rich was stronger than ever. 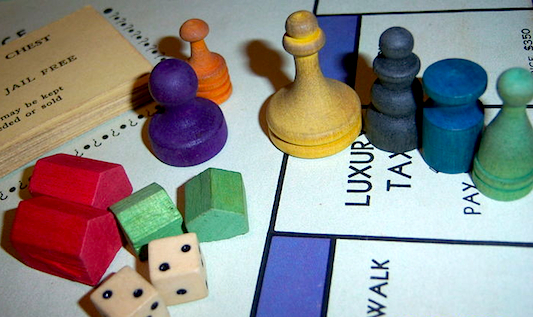 This inherent contradiction of American culture—which both condemns and celebrates greed—is perhaps best embodied in one toy, Monopoly, the most popular board game in history. 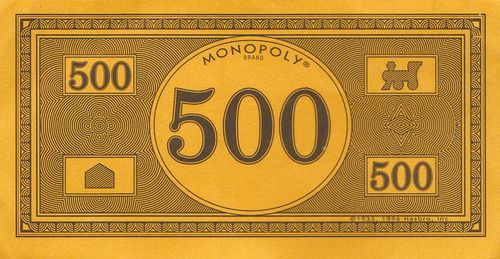 A smash hit when it was introduced in 1934, Monopoly has sold more than 200 million copies to this day. Given you’ve probably played Monopoly at least once in your life, you know that the point is to get rich at the expense of the other players. You win through ruthlessness. In the era of “Who Wants to Be a Millionaire” and “Deal or No Deal,” it’s not at all shocking to equate riches with “winning” at family-friendly games (instead of winning at adults-only gambling). But before the 20th century, this wasn’t the case. 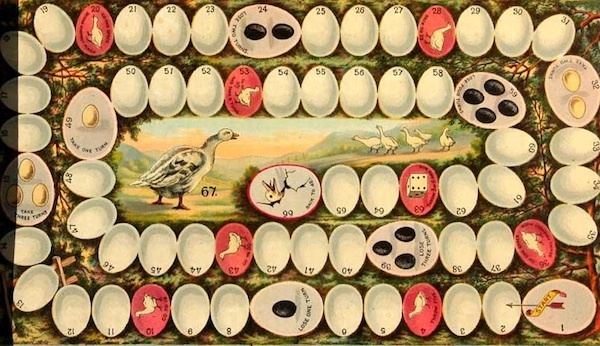 A French version of the game Goose, which inspires board games to this day. Your standard flat board game can be traced back to an 1500s Italian game called Goose, as can the playground game Duck, Duck, Goose. The basic concept is that players race along a track, made with a certain number of sections. When you land on particular sections by chance, you’re sent forward or backward, and the winner is the one who gets to the end of the board first. So what did you win before play money became a motivation? Virtue. That’s right, good character. At the end of the game, the winner got to claim the title of the Most Virtuous Person in the Room. Most versions of Goose and its spinoffs feature “vice” and “virtue” sections. If a player lands on a sin, like a picture of a sleeping man indicating sloth, he has to move backward. A picture of men shaking hands depicts an act of civility, allowing the player to move ahead. The New Game of Virtue Rewarded and Vice Punished, first published in 1818. Via BoardGameGeek.com. 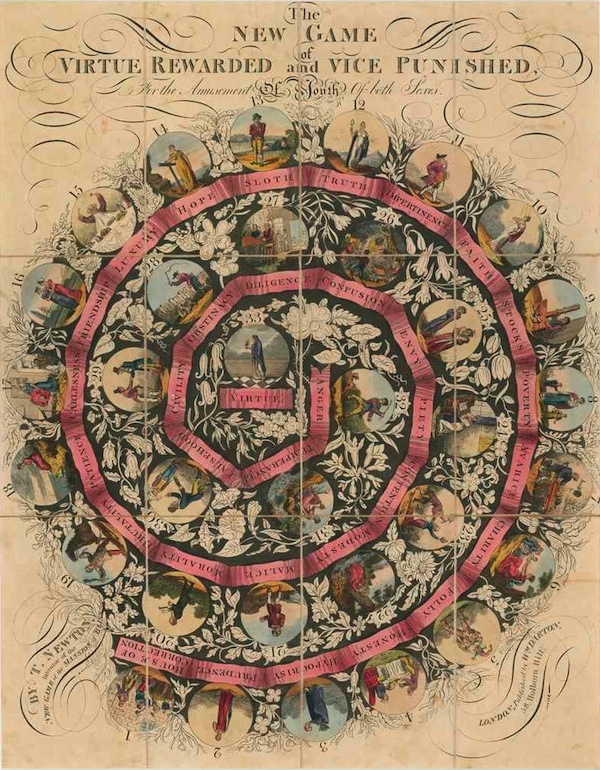 In fact, the very first American-produced board game, The Mansion of Happiness, published in 1843 by the W. & S. B. Ives Company, was a version of Goose that punished players for landing on “sinful” squares and rewarded them for landing on “righteous” ones. 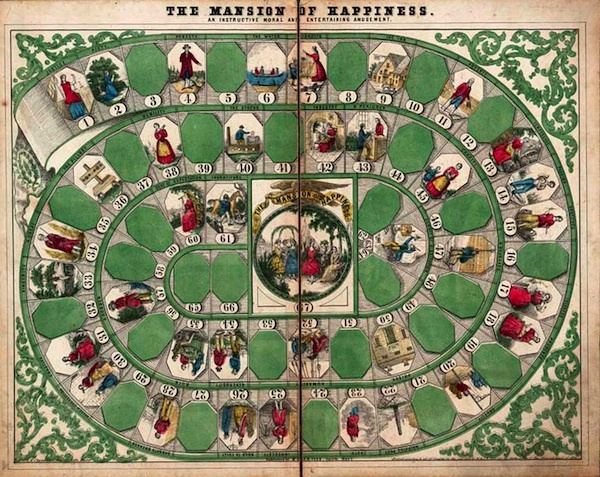 The first game published in the United States, The Mansion of Happiness, “An Instructive Moral and Entertaining Amusement.” Via the U.S. Library of Congress. But George S. Parker was bored by such moralistic games—like the card game called Everlasting he’d play with his brothers as a kid. He changed the game up a little bit, made it about trading stocks, and named it Banking, which he self-published in 1883 at the age of 16. While the Parker Brothers company set about trying to make board games fun, publishing action-packed games about the Gold Rush or the Spanish-American War, some folks around the turn of the century were still bent on using the board as moral instruction. Elizabeth Magie Phillips, for example, was a devotee of Henry George, an economic-reform activist who believed it was wrong to get wealthy from property ownership. In 1903, she created a game called The Landlord’s Game, which used the neighborhood streets of the players, to point out the evils of the real-estate market. 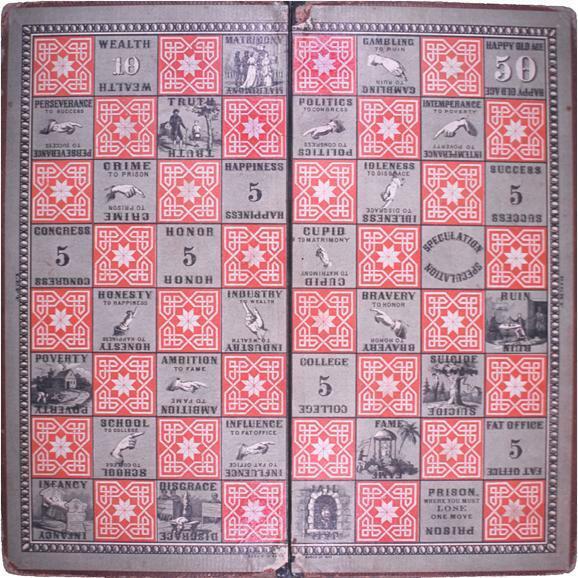 Milton Bradley’s The Checkered Game of Life, published in 1860, which eventually became Life. Thirty years later, in the middle of the Great Depression, another version of The Landlord’s Game, landed on George Parker’s desk. An out-of-work engineer named Charles Darrow presented his hand-painted board, based on streets in Atlantic City, called Monolopy. This time, it wasn’t intended as moral lesson, but as a vicarious way to gamble as a real-estate tycoon. Now, you’d think that the inventor of Banking would appreciate this concept. But Parker rejected the game, giving Darrow a list of “52 reasons” the game would fail, including the fact that it took more than 45 minutes to play. 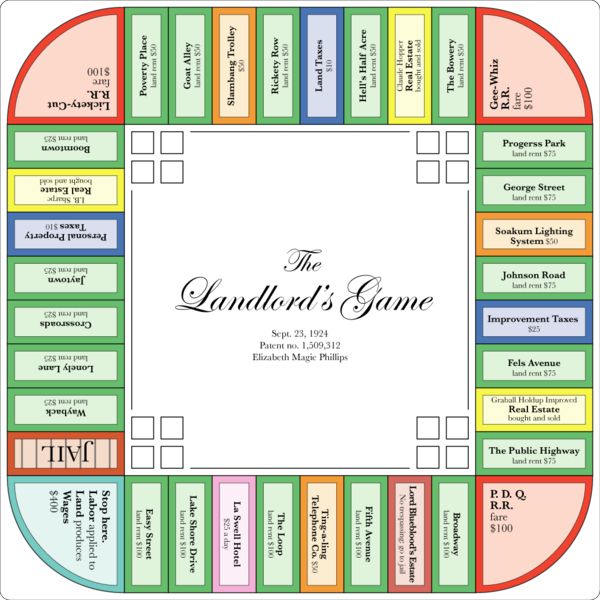 The Landlord’s Game, based on Elizabeth Magie Phillips’s 1924 patent. Via Lucius Kwok, from the Wikimedia Commons. Unruffled, Darrow took his game to the Wanamaker Department Store in Philadelphia, where his hand-painted boards sold faster than he could make them. 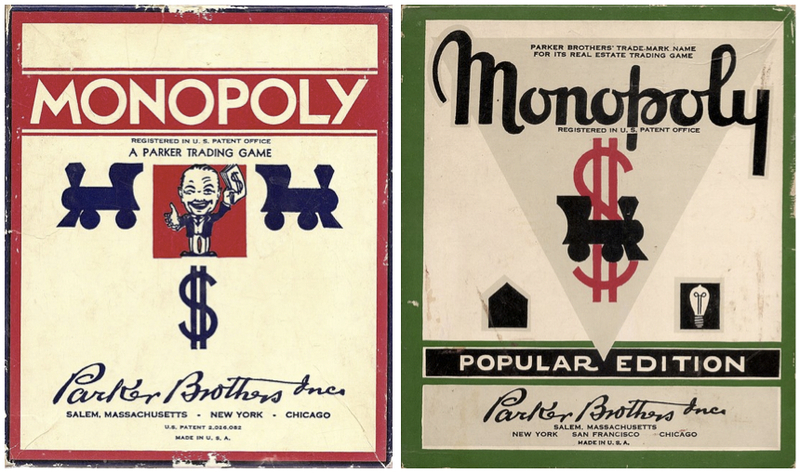 In 1935, Parker Brothers agreed to publish Monopoly, which brought in big bucks for the company—real ones. At the same time, the game captured the public’s imagination with the intoxicating power to accrue pretend fortunes that most people would never see in real life. Board pieces and Community Chest cards from the 1936 edition of Monopoly. In the 1930s, a slew of games about capitalism and profiteering flooded the market, including Cargoes, Bulls and Bears, Big Business, Easy Money, and even the original The Landlord’s Game. Another take on The Landlord’s Game strikingly similar to Monopoly, called Finance and Fortune, came out in 1932, three years before Parker Brothers’ game, but for some reason never achieved the same sort of monolithic success. And board games promoting virtue all but disappeared. Being calculating and ruthless was now the way to reach a game’s end goal—be that money, property, or a big promotion to the office on the corner. Even The Checkered Game of Life was reconfigured as The Game of Life in 1960. This time—you guessed it—in the end, the player with the most cash wins. I would add to your list of games promoting moral behavior the still-in-print Chutes and Ladders, an obvious descendant of the “Mansion of Happiness” line of roll-and-move games with rewards and penalties based on themes of virtue and good behavior. Interestingly, today’s Game of Life has added “Life tiles,” which represent personally enriching life experiences like traveling abroad. But the contemporary version does not necessarily reward choosing college to start the game, since it incurs $100,000 in student loans and still risks landing a low-paying job even after graduating with a degree. And back to your ultimate point, those “Life tiles” translate to dollar values when reconciling the final score to determine the winner. So it’s still all about the money. I WISH “takes more than 45 minutes to play” was still a reason to not publish a board game. I see you over there, Risk. You too, Rune Wars. Twilight Imperium, I’m not even speaking to you. Very interesting read… hadn’t thought of this before. It’s fascinating, especially in the context of family game night. Parents spend a good deal of time considering what books, games, and various educational software to give to their children. I wonder how many have considered the subtle suggestion of monopoly. Fun! More people should play Settlers of Catan. No money involved, instead you build towns and houses with the materials you acquire. It is interesting that many games of late have started coming back to that 45 minute “super filler” sweet spot, driven mostly by the perceived inclinations of the “Spiel Des Jahres” jury and the German family game market. I for one still enjoy a 13 or 14 hour game of Civilization but getting enough people together for that long is proving more and more difficult.